Did you figure out the answer to the riddle? The answer is a ‘Blended Learning Program with a Knack for Motivating Learners’. Now that I’ve got your attention, let’s break down this riddle using a simple formula. We will begin with a basic review of the benefits of a Blended Learning program. Imagine having the ‘best of both worlds’! A little bit of one-on-one with an instructor, some practice assignments and hands-on activities in the classroom, and a few self-paced learning modules all rolled up into a program that may be anywhere from one day to several weeks. I remember working on an SAP project a long time ago that on-boarded new sales associates using a four-week blended approach. A couple days per week of classroom activities, a few days of eLearning, and dedicated one-on-one time with their mentor scattered throughout the week. They also spent time sitting with more experienced sales associates listening to calls and role-playing with other trainees. Now that we have defined blended learning, let’s talk about the elephant in the room: The Progress-Rewards Indicator — which I believe to be a more advanced and integrative version of the standard progress bar. 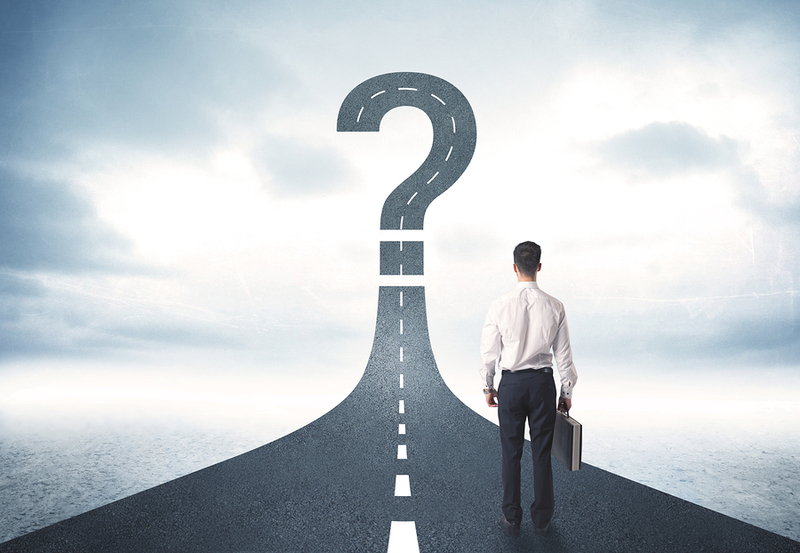 I started to use progress-rewards indicators in my courses years ago when I worked with a few clients who were more open to unconventional, ‘out-of-the-box’ themes in their eLearning programs. The responses from learners were overwhelming. There was a noticeable 30% increase in module satisfaction surveys! I was able to create an indicator, without designing an entire ‘game’ around the theme, which is usually referred to in the industry as gamification. 1) Set a theme for the course. i.e. detective theme, carnival theme, storefront theme, office space theme, etc. 2) Establish the end goal. i.e. With the detective theme, you could earn 10 gold stars to earn your shield and save the ‘victim’ used in the main scenario (learners LOVE being the hero); a car wash or carnival theme where you punch their rewards card each time a task is completed (earning a prize when the card is full); or, a storefront theme where you reward points or money every time the learner proactively and correctly communicates with a customer. An example of a final prize or reward could be naming them ‘employee of the month’ with a certificate. 3) Incorporate audio and text instructions, as well as graphics into your storyboard before development. You can use and alter stock photos easily, or use a graphic designer, if that’s your preference. 4) Establish the style and layout of the eLearning slide. 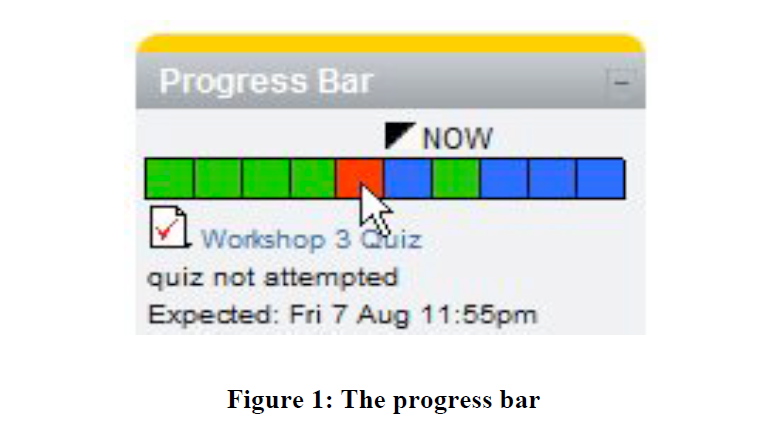 Determine where on the screen the Progress-Rewards Indicator will be displayed —so as not to distract the learner from the content. 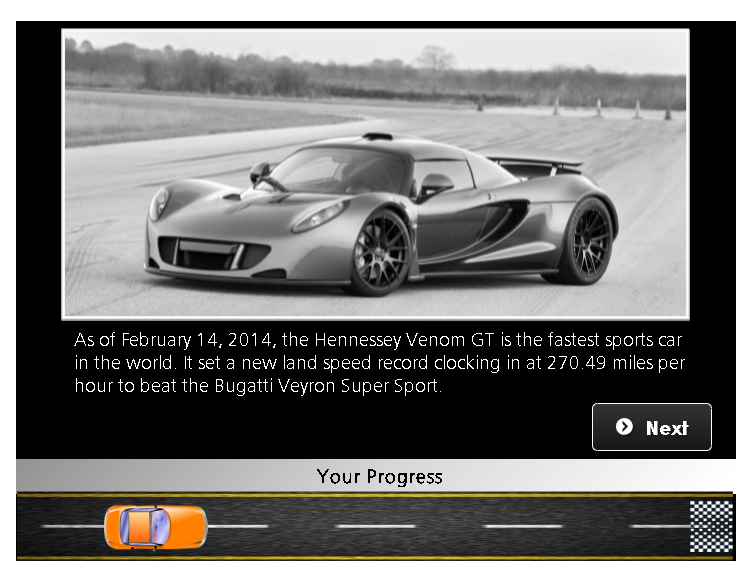 In the example below, the progress bar in this trivia course about the history of automobiles is located at the bottom of the slide, and is designed as a racecar trying to reach the finish line. 5) Create each task in a separate ‘scene’ or ‘chapter’ within your learning development tool. It will be easier to determine the completion of each task. 6) Set requirements and triggers accordingly to ensure each learner completes the tasks required to reach the goal. If you are new to programming with development tools, I would suggest you avoid goals that require complex trigger calculations. Keep all tasks in sequential order, and if a task is completed, move them to the next scene. It is much simpler to build upon your indicator display this way. i.e. Task 1 complete, 100 points earned and 100 points displayed; Task 2 complete, 100 points earned and 200 points displayed, etc. If a task is not completed, jump the learner to the following scene and display the correct points on the indicator. Lastly, be sure you have an LMS that can track when learners meet their goals! And remember, ANY Progress-Rewards Indicator you choose can follow your learner throughout the entire Blended Learning program. They can easily mark points earned in the classroom in their Participant Guides or Workbooks during the ILT portion of your course. Not only do these nifty indicators motivate learners individually, but they also create competitiveness among groups, which can also be a great form of motivation. I hope this post has helped you in identifying ways to motivate learners with Progress-Rewards Indicators within your Blended Learning and eLearning programs. Cheryl Powell, CEO of GC Learning Services LLC dba Learn2Engage, is in her 22nd year as a Virtual Instructional Design and e-Learning Specialist, with clients all over the US and overseas. Additionally, she is a published author of various works of fiction and motivational speaker. Her industry experience industry experience is vast, and includes Telecommunications, Finance (Mortgage, Banking and Credit industry), Sales, Pharmaceutical, Media, Software Development, Healthcare, Food and Beverage, and many more. She holds a Bachelor in Business Management, a graduate certification in Project Management, and a Master of Science degree in IT Project Management. She has studied the Adult Learning principles of experts and theorists such as Gagne’s (nine events), Maslow’s (hierarchy of needs), and Dr. Ruth Clark, to ensure her courses, presentations, storyboards and modules, engage the learner, utilize the proper balance of white space, text and graphics, and result in high Learner Retention rates. Her clients return year after year for the affordable pricing, her rapid customer response rate, and the benefits they observe in the productivity of their employees after taking her courses.